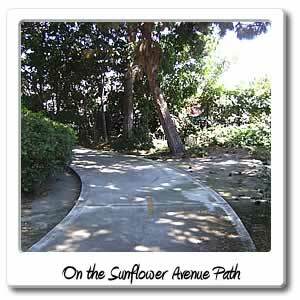 Welcome to Sunflower Avenue on the Santa Ana River bicycle trail. 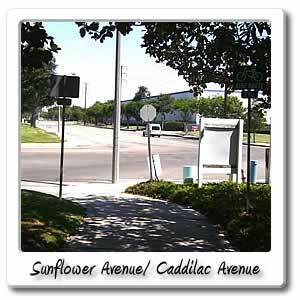 Coming from Huntington Beach and mile marker 0 you'll find Sunflower Avenue in the City of Costa Mesa at 4.75 miles from the beach. 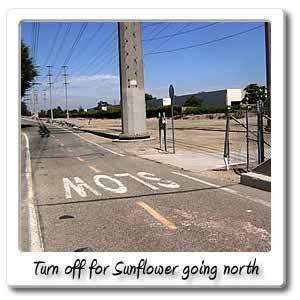 You can find it a little bit after Moon Park and the 405 freeway. At this point you'll be 24.05 miles from Green River Road at the other end of the Santa Ana River Trail, Orange County section. 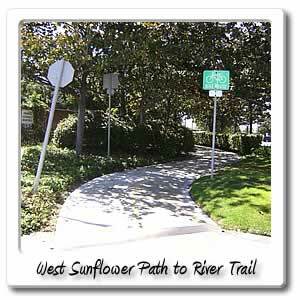 You will go through a concrete trail, next to a parking lot and at the end empties out to Sunflower Avenue, by taking that 2.5 miles east you'll end up at South Coast Plaza, in the City of Costa Mesa. At South Coast Plaza, you will find major department stores, such as Nordstrom, Sears, Macy's Sak's Fifth Avenue and more. You will also find 250 other retailers, in this upscale and luxurious 3 story shopping center, that has the highest sales in the U.S. and is the largest mall in California. There are 4 different Performing Arts Venues around the same area. There are several places to eat around South Coast Plaza, with most of them being off of Bristol Street. 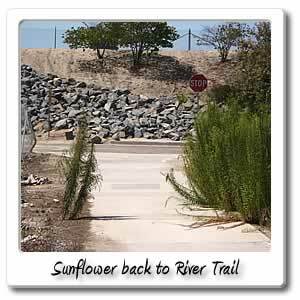 Going this far off of the Santa Ana River Trail, for food and drink, isn't suggested, if you want a quick trip back onto the trail. 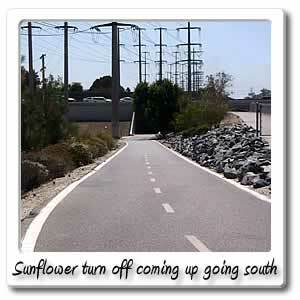 Going north on the Santa Ana River Trail and exiting at MacArthur Boulevard, is the best bet, but you can also go south to Gisler Avenue, but better than that, but a little farther is Adams Avenue, where you'll find more places for food and drink.